Three circular pistachio green beads, iridescent acrylic beads and sterling silver wire are used to create this look. They are approximately 1.75 inches in length. 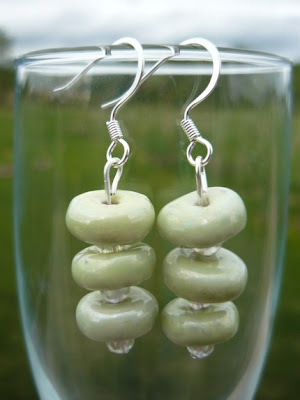 Designed using 15 circular glass beads attached to white nickel these beauties are 1.75 inches in length. 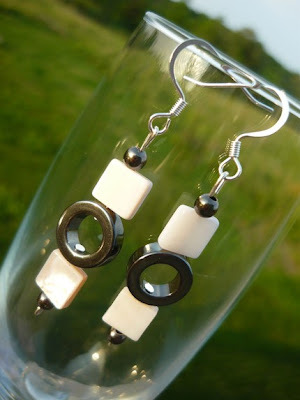 A unique geometric design from hematite and white glass beads, these earrings are 1 5/8 inches long. How do you enter to win? Easy! 1. Check out Accessory Love. Come back here and tell us about your favorite item. Entries will be accepted until midnight Saturday. Check back Sunday to see if you are the lucky winner! Some very cute and fun earrings! I like the Pistachio Green Dangle Earrings. I like that the color is very soft, dainty and simply ideal for Summer. Thanks for the lovely giveaway. I'm a follower, thank you. I don't have my ears peirced, but this is cool! 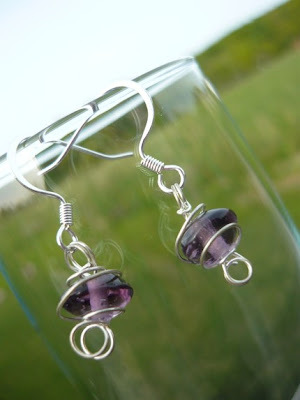 Love the purple pink glass beads dangle earrings! 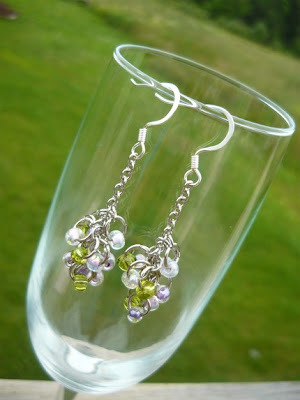 LOVE the Purple Pink Green Glass Bead Chain Dangle Drop Earrings. Great design, like the use of chain.